A couple of my buddies and one of my favorite websites, WhatReallyHappened.com, have been urging me to really check out Republican presidential candidate Ron Paul. Paul is a Texas physician and former candidate for prez under the Libertarian Party who was elected to Congress as a Republican. The dark horse contender for the GOP nomination has created quite a buzz among the “freedom loving” Libertarians on the Internet even as he is being ignored by the mainstream media. Many are attracted to Paul’s populist message which is a throw back to traditional conservative thought. 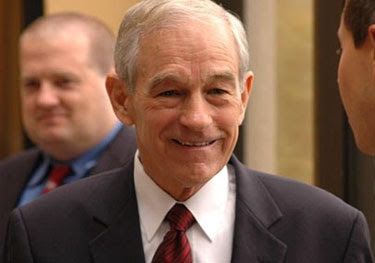 If he had his way, Ron Paul would abolish the IRS, abolish NAFTA, and end the Iraq War immediately. He would also abolish Medicare, abolish Roe v. Wade and seriously restrict access to social services for undocumented workers. But I wonder how those conservative friends of mine (Reformed Leftist Paul Hue, and Terry MClain of the upstate New York rock group Guiltless Cult) will react to Paul’s recent appearance on conspiracy theorist hero Alex Jones’ show. Those of you who are regular readers of this blog know that I agree with Paul here. I quoted him in a January post when he warned Americans to be on the lookout for “A New Gulf of Tonkin” style incident that would provoke war with Iran. I also admonished that we should prepare for a domestic terror attack or “A Second 911“. Michael Cherthoff’s “Gut Feeling” that the US may experience a terror attack this summer gives me confidence that my own intestinal intuition may be on point. Of course, Bush appointee Cherthoff may know something that Ron Paul and I don’t. I also agree that Iran’s actions to move away from the sagging dollar (currency of its chief antagonist, the United States) as a reaction to Washington’s pressure may potentially cause the bottom to fall out of the American economy. Bloomberg reports that Iran has asked Japan to start using Yen for its oil transactions instead of US dollars. Japan is no fool. It said “yes” to its third leading oil supplier. This spells great danger for the already ailing US currency. I know that Paul Hue usually blows off my tendency to recognize what some might call conspiratorial patterns as paranoia. Will he feel the same of his new Libertarian role model? So what’s up, Paul? Terry? I’m calling you out. What do you think of this? And if anyone else wants to comment, feel free. The one thing I like about Ron Paul is that he doesn’t subscribe to the conspiracies outright, but he is on track with the abolition of the federal government. He does listen and knows the more important message is to take back our country for our liberties period. Even though it would seem like a lot of programs would be taken away (Medicare), at this point I am for a clean slate because if the people had a voice we could all work together to provide sane and managable gov’t as well as programs we could all benefit from in Congress. Ron Paul is our only choice for this. I think from the range of people I have been seeing at RP’s rallies, this demographic goes farther than it would seem. There were old/young, multiple races and backgrounds, religions with one thing in common. We are all AMERICANS- looking for a solution to end the wars that are started in our name, with our tax money and repair our country that has been left battered and bruised from inside. Is it no wonder that over a million Americans turned off their TV sets and instead opt for a more free choice via the internet? Ron Paul is gaining steam and soon all media will not be able to ignore him, because his popularity is already making him valuable. Enough so, that he has raised more than McCain’s team has on hand (2.5 million) and with having so many people support him (Dr Paul takes no corporate contributions), we are seeing a new era of grassroots support. We are seeing an end to the blind sheep who listen to Limbaugh & Faux News and really want a fair & balanced gov’t. Now, if we can just get to a reliable voting system, because source code fraud has already been exposed by a notable software engineer (google rigged elections). He couldn’t comment on whether he worked for Diebold, our lovely election machine makers. Conspiracy or do we have a reason now to question this government?!?! The scary thing is, as we have been shown, Bush can barely tie his own shoes, much less run the country. We have a lot of work to get these power elitist shills out of our administration and back where they belong: In their own mandated federal prisons suffering the same habeus corpus free treatment. I will vote for Ron Paul in the repo primary, and — if he’s on the ballot — in the general election (if he’s not, I’ll vote whoever runs as a Libertarian). – Shrunken govt, including elimination of Homeland security dept, as well as depts of education, energy, etc. – Elimination of “foreign aid”, treaty obligations with NATO and Israel, all foreign-soil military bases, and even the sort of military operations in Afghanistan and Iraq that I supported with Bush II (I have always thought that the Pat Buchanan/Nadir response was one valid option). 1. He opposes NAFTA, and is a staunch economic isolationist who worries about trade deficits. 2. He apparently believes in the possibility of Bush-led staged terrorist attacks, or at least a Gulf of Tonkin-type incident. 1. Bush reacted so imperfectly to it; the advocates of a conspiracy both claim that “he knew” and simultaneously fault him for his “deer in the headlights” reaction. If Bush personally, or his master planners, staged this attack, why didn’t they stage a more solid initial reaction? 2. Advocates of a conspiracy claim Bush used this to provide a pretext for invading Iraq & Afghanistan, yet the linkage between the attack and these supposed targes was very imperfect. If Bush, or an “unseen hand” unknown to Bush, had created 911 in order to provide this pretext, why not bother to plant clear-cut linkage between the strike and Hussein, Bin Laden, and Mullah Omar? 4. The 911 staging itself was so perfect, and all the black ops people have so perfectly kept their secret, this drastically contradicts the massive imperfections of the three points above: Bush’s clumsy reaction, the lack of a clear linkage between the ostensible attackers and Iraq/Afghanistan/Al Qaida, and the lack of planting WMD in Iraq. he and other lefties expected an “October Surprise”, which never came. Bush has suffered several times from very low numbers; why never another attack to help him? Thus I must believe that if an attack does materialize, it will be authentic. 1. Me voting in place of Nadir. 2. Me voting in place of Nadir’s dead grandfather. 3. Me voting multiple times as myself (registered in multiple states). An accurate and reliable system would also require both an electronic and a multiple-print redundancy, as well as observers from various districts and party affiliations scrutinizing the official proceedings as well as each other, and each performing their own independent counts while watching each other. Voters would have to have a chance to view and verify the printouts of their votes, and keep a copy as a receipt. Their electronic vote and their duplicate printouts would need to have an electronic uniqueID which only they could associate with their confirmed photo ID. Although this would enable Nadir and me to trade votes, it would prevent either of us from later claiming more than one of the votes. I would also have video cameras at recording everything and running on websites, so that all citizens can observe, not only those who physically show up at one location. Well, I guess now I can buy into the conspiracy, my Guiltless Cult myspace page was deleted. Guess I shouoldn’t have had those Ron Paul videos up… Hahaha, they have no idea who they are dealing with. I can make enough music content to parody myspace into submission. Prepare for the new anti myspace band, The Pissons. Coming mostly to YouTube (I think Rup wouldn’t let these songs be heard).